How do I plant them? Do I let them dry out for the winter or do I plant them while they are still green? In the fall of the year for new growth to start for the spring? 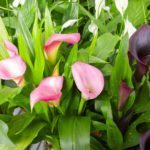 Calla Lily rhizomes are generally planted in the spring after danger of frost has passed.